The uses of 100% pure silk ribbon are innumerable but include hand and machine embroidery, doll dressing, decorative serging, smocking weaving and more. 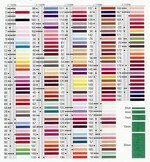 All colors on this chart are available in 4 mm widths. However, some colors are available in 2mm & 7 mm. Refer to the dropdown box for the colors that we currently have in stock.